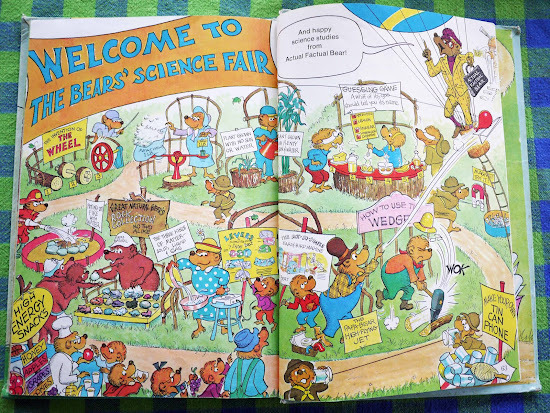 Of course, you all knew I would chime in the moment I heard of Jan Berenstain's passing. Death is always a sad thing, but to die suffering from the aftereffects of a stroke is heartbreaking. I extend my warmest sympathies to her family at this time. You all know I am a lover of the older Berenstain titles, and have often lamented the fact that my son loved the Bears' newer morality tales with so much loyalty and passion. I am not alone in my annoyance, as for years, all sorts of book watchers have griped their way through the Bear bibliography. But to dance on the grave of someone who built her life around bringing such joy and color to the lives of so many children, is just a totally (excuse my French) jackass thing to do. No matter how tiresome the Bear library might seem to parents, they are gold to children. 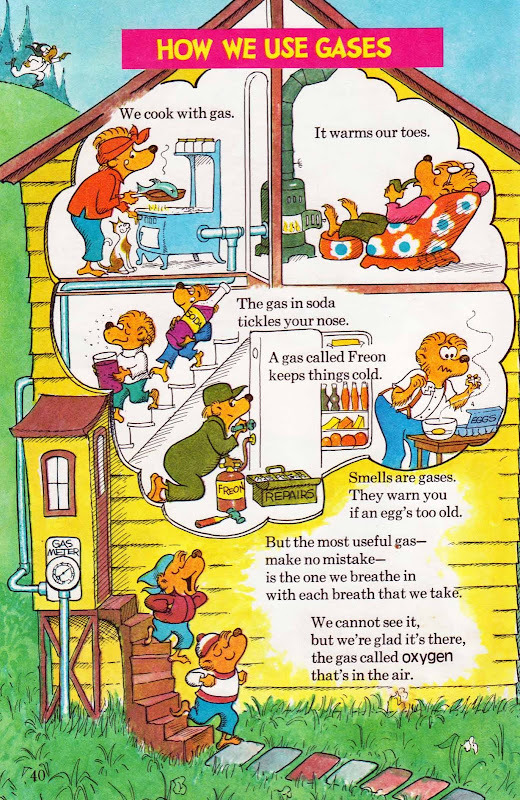 I remember being small and reading Berenstain Bears for what felt like hours at the bookstore, and no matter how boorish my adult self felt them to be, the child in me always remembered. To my own son, the Bear family are dear friends. I know that my opinion, like that of so many culture commentators, is just an opinion. My blog is often riddled with typos, and I overuse all sorts of trite words like awesome and cute and adorable and dear. But my words are just words. Hot air blown into the wind. The world that Stan and Jan created together will be around, if not forever, then for a very long time. All us hot air blowers should be so lucky. Speaking of hot air, I'll take today to celebrate and finish what I feel to be the Bear family's trifecta of awesome. (There, I said it again, awesome, awesome AWESOME!) 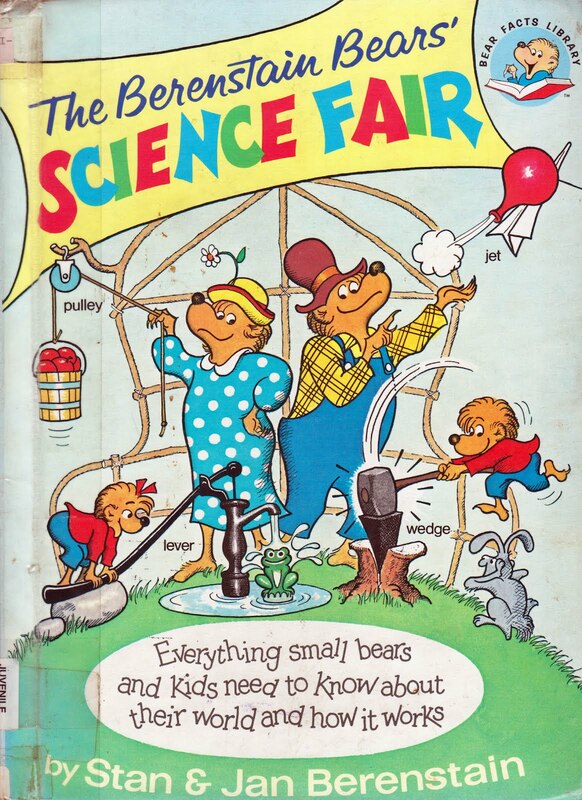 I've reviewed the other two books in the Bear Facts Library, The Berenstain Bears' Nature Guide and The Berenstain Bears' Almanac, and now let me take you to their science fair. 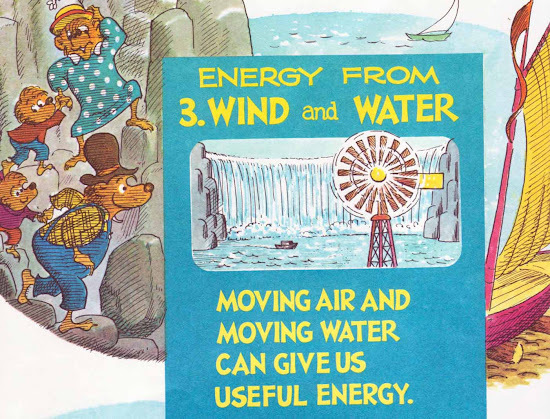 Seriously, these three Berenstain titles are must-haves for any young person's library. They're busy and educational, over-sized and full of fun. Of all the Berenstain Bear titles that riddle the shelves of book stores everywhere, it's true shame that these have fallen out of print. 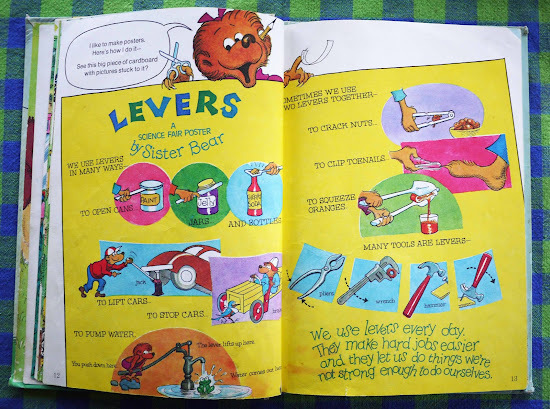 Sure, in an updated incarnation, they'd probably need to add a section on computers, but hell, my kid gets enough about computers all day long, it's nice to get back to the basics like levers and wedges and energy and gas and how to make your own tin can phone. you must learn about science. Follow me, Sister! Come along, Small Bear! that you are so smart! Ah yes, predictably, Papa Bear muddles his way through such topics as "Machines and How They Work", "The Science of Matter" and "Actual Facts About Energy", but in the end, each member of the family has a project to display. Mama Bear, always the cool and steady voice of reason, helps the cubs find a better understanding of the world around them. No matter how you feel about the package or the voice, isn't that what's important? Last night, my son pulled all his Bear books from the shelf and piled them on the floor. Then, he curled up in bed with his dad to read a selection of faves (The Bear Scouts and The Big Honey Hunt, respectively). When I came in to kiss him goodnight, he looked at the pile and said, "Wow, we have so many. Isn't it wonderful?" Mama Bear will surely be missed on this sunny dirt road. Any artist who my son loves with so much of his heart is OK in my book. Thank you, Stan and Jan, wherever you are. Thank you so much for this! My kids have my old copy of this book, I didn't own any other Berenstain Bears books myself when I was little but my boys are lucky, we have managed to acquire copies of Bears in the Night, the Spooky Old Tree, Old Hat, New Hat and many others. They are fabulous, thanks to Jan and Stan, they have left the world a lovelier place for their being here. 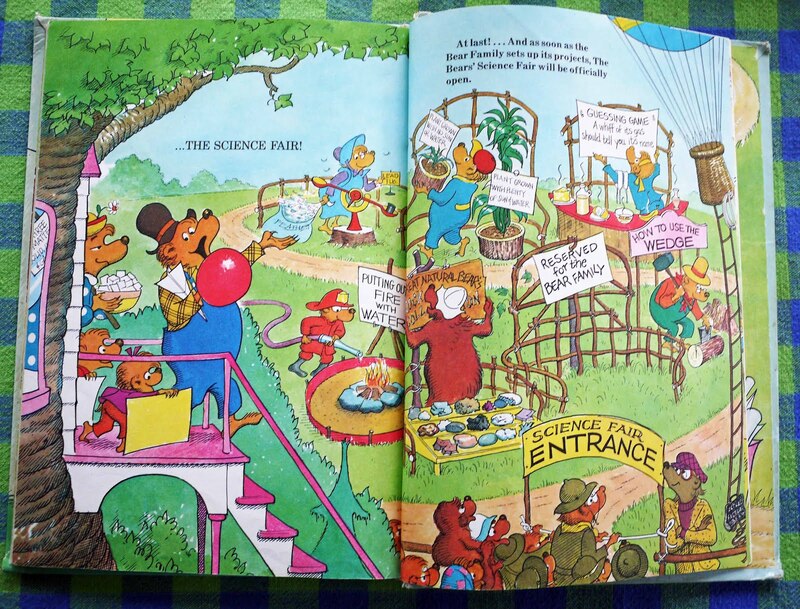 New reader to your blog (and also obsessed with vintage kids' books)... the Bears' Almanac is one of my all-time favorites, with the Nature Guide not far behind... and I never knew about this third volume. Thank you, thank you... I am hopping off to eBay to see if I can find a copy. 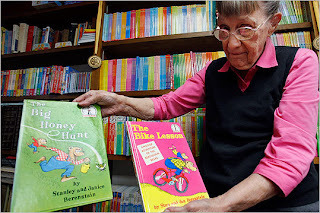 I totally agree with you about the early Berenstain books. 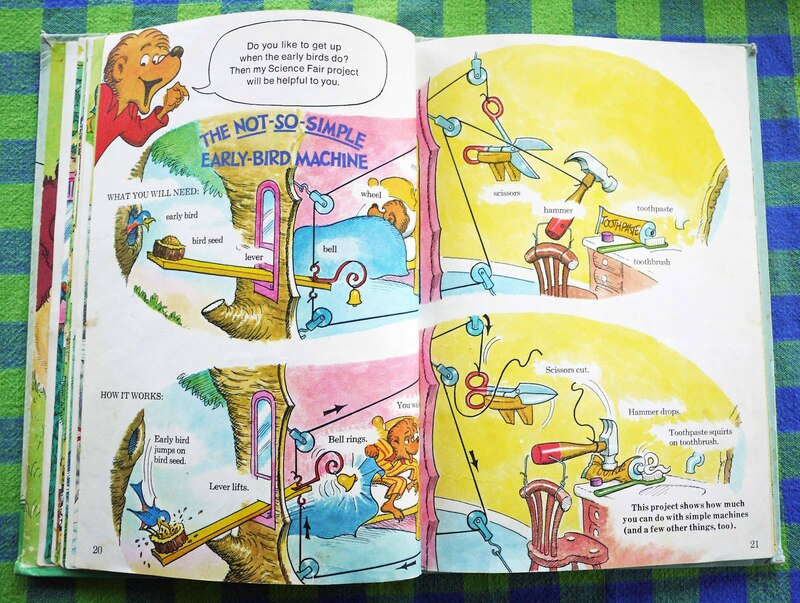 The early readers (Bears in the Night, The Bears' Picnic) are also fantastic. I love this -- one of the most worthwhile posts I've read in some time. Thanks! 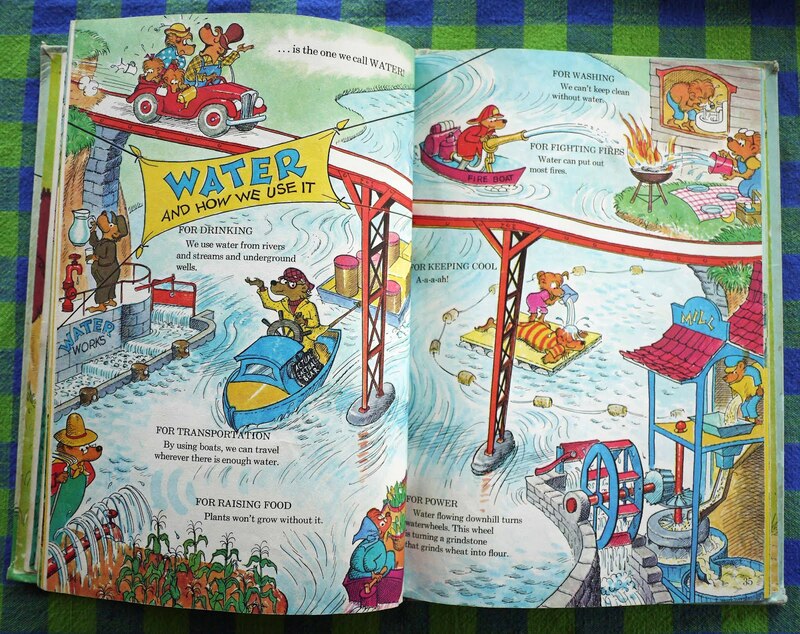 I enjoyed your post on the old Berenstain titles. I wrote about them too, on my blog (http://rarestkindofbest.wordpress.com/2012/02/29/jan-berenstain-rip/). I've never seen the Science Fair one though, must look it up! Thank you for this wonderful blog on our "Science Fair" and for all the wonderful comments as a result. 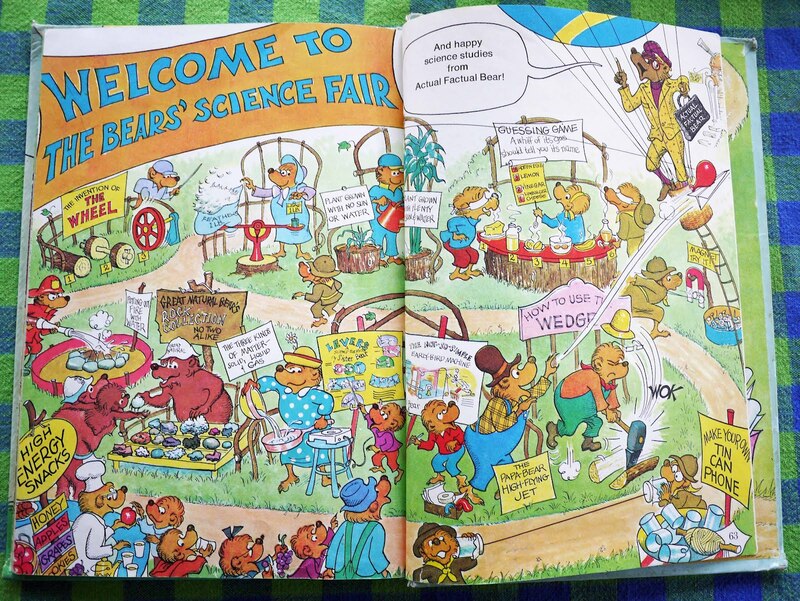 We are pleased to tell you a bind up of all three: Almanac, Nature, and Science Fair, will be released as The Berenstain Bears' Big Book of Science and Nature in January 2013 by Dover Publications. 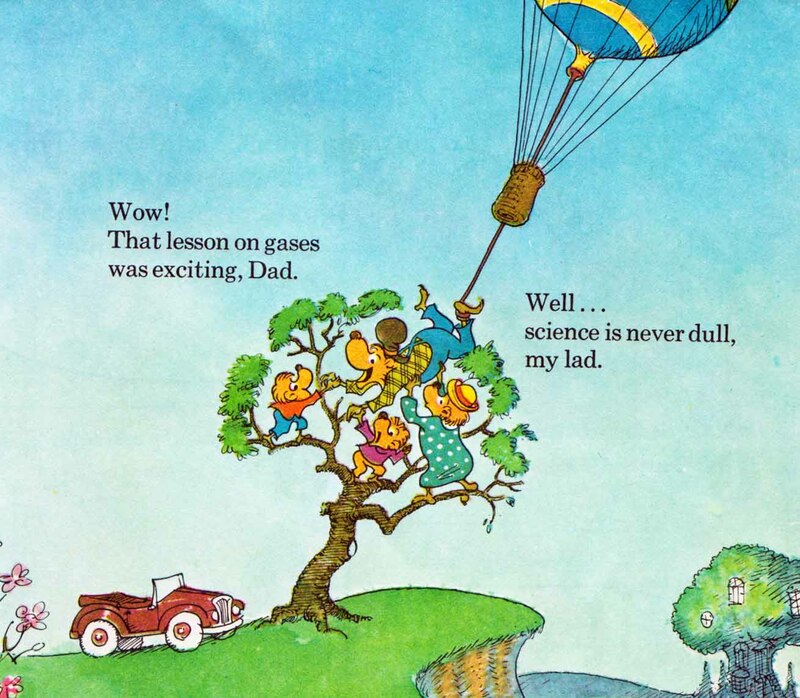 Dover Publications will be reprinting the Science Book in January!